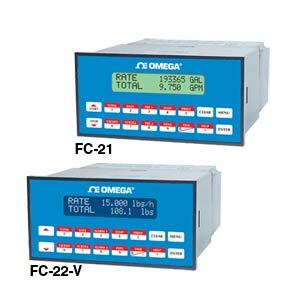 The new Model FC-21 multifunction batcher and the Model FC-22 flow computer satisfy instrument requirements for a variety of flow meter applications. Omega offers many different types of flowmeters: paddlewheels, turbines, positivie displacement, annemometers, mass flow, etc. for many application solutions. The Model FC-21 flow computer is suitable for liquid batching, volumetric batching, and corrected volume applications. The Model FC-22 was designed for liquid, gas, steam, and heat applications. Multiple flow equations are stored in both models. These versatile flow computers are user programmable from the front panel. The user assigns hardware inputs and outputs to suit the particular application during setup. Isolated analog output can be chosen to follow the volume flow, corrected volume flow, mass flow, temperature, pressure or density by means of menu selection. The standard RS-232 serial port for datalogging, transaction printing, or for connection to a modem for remote meter reading can also be assigned by this method. 참고: Download PDF file for additional options and full specifications. Comes complete with set-up disk and operator's manual. For 220 VAC, add suffix "-220VAC" to model number, no additional cost. For 12 VDC, add suffix "-12VDC" to model number, no additional cost. For 24 VDC, add suffix "-24VDC" to model number, no additional cost. For NEMA 4 (IP65) wall mount, add suffix "-NEMA" to model number, consult Flow Engineering for price. For VFD display, add suffix "V" to model number, consult Flow Engineering for price. For an explosion proof box (no button access), add suffix "EXP" to the model number, consult Flow Engineering for price. For RS485 serial connector, add suffix "-RS485" to model number, add $310 to price.